I made it through week 1 of my training plan! Thank goodness, because if not that would be a bad sign…I’m looking more and more forward to this adventure. I’m trying to get M. and or my mom to go down to Maryland for the race, and the charity team director and I are working to get my registration moved up to the marathon (it’s been a three week process so far…). While a couple days of my plan did get a little moved around, I was happy with how it went! Tuesday: am: 3 mi (10:54 avg). It wasn’t hot, but the 91% humidity was killing me! This felt really hard. Obviously thought I deserved wings after a 3-workout day! Friday: 2.75 mi, 27:07 (9:52 avg). Cut it .25 short due to yet again more tummy issues. GRRRR. However it was the most beautiful day and I wish I could have ran forever! Saturday: 8.21 miles @ 10:26 avg. The first 5.21 were on my own, done in 4:1 run/walk intervals. (My plan is to do a run/walk approach to the marathon to avoid injury). The last 3 were with the running group at work. The avg. pace for the 5.21 and 3 were both 10:26 which made my little OCD brain happy. Sunday: Rest. Helped M. move out of his old apartment and sunk into a book when I got home. I was incredibly happy with this week, especially my long run. I actually really enjoyed the intervals. The timing of them was perfect (based on the Galloway method) and I kept a pretty brisk pace during my running segments. All I need to do is figure out my stomach. It’s been giving me problems in general all week! How did your workouts this week? Are you training for anything in particular? Great job, Sam! Can’t wait to watch your progress through this cycle. It’s so exciting to start a new training cycle! Thanks Dani! I’m excited to get into the harder weeks. It already feels like the race is so soon. Sounds like a great week and the perfect way to kick off the training cycle! Looking forward to following your training over the next few months! Congrats on a great first week! GI issues can be so frustrating, hopefully you will work them out soon! What journal is that? It looks really cool! 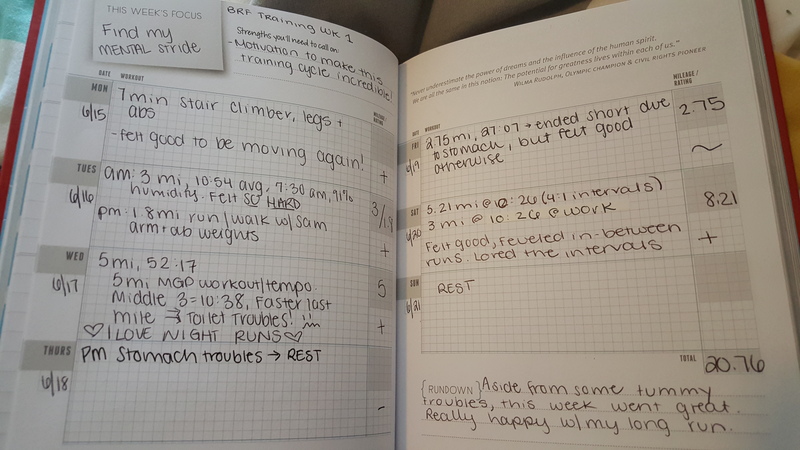 It’s the Believe journal, by Lauren Fleshman! I love it!